Adult NASA space suit (orange) - spacekids - space toys, dressing up costumes, kids spacesuits, astronaut food, cool space stuff! An adult version of our beautifully made replica space suit, closely modelled on the genuine NASA Shuttle pilot spacesuit. The suit features chest and waist harness buckles, and a padded neck collar ring. There is a NASA Emblem patch on the chest, a NASA Logo zipper, Commander patch and a Space Shuttle patch on the arm. 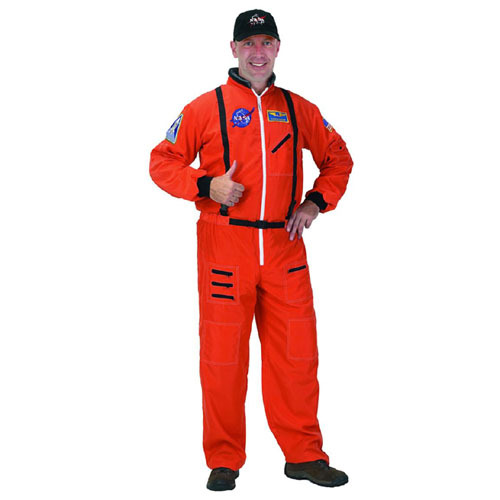 The suit also comes with an adjustable black baseball cap embroidered with the NASA logo. The astronaut suit is also available in white NASA colours.